Hungary's proud and often crowded capital city, Budapest is truly unique and endowed with a wealth of remarkable architecture and culture. Beyond doubt, it is one of the world`s most beautiful cities with its royalty and romantic tone which makes it so charming and fascinating. In Buda, contrary to many other capitals, the royal castle really is at the top of a hill, as it is in all the best old stories. Known as the Royal Palace of Buda, it is visible from virtually every point in the city. Not just one but three castles have been built on this site. The first appeared in the thirteenth century after the Mongol invasion and was a thick-walled fortress intended to withstand enemy attacks. Few contemporary descriptions have survived but archćological digs have revealed fragmentary remains. In the fourteenth century it was enlarged in the Gothic style, and then at the time of one of Hungary’s greatest monarchs, King Matthias, it was remodelled into a Renaissance palace famed far and wide. The Turks took Buda without a battle in 1541, and for a while the medieval buildings remained structurally intact. However, they suffered grievously later through siege, conflagration, explosion and earthquake. The city walls often had to be patched up and new bastions built, and today a part of the fortifications from this period can still be seen. Having lasted almost 150 years Turkish rule ended with a three-month siege, and this heralded the third main period of castle building in Buda. Ruined buildings were cleared away, cellars filled in, and in 1714 the building of a baroque palace began. It was further extended in the nineteenth century into the form with which we are familiar today. The Royal Palace was completely burned out in the Second World War, losing in the process its valuable furniture and art treasures. On restoration it was converted into a centre of culture becoming home to the medieval, Renaissance, baroque and later Hungarian masterpieces that comprise the permanent collection of the Hungarian National Gallery. In separate wings of the palace complex, the Budapest History Museum, the Museum of Contemporary Art, and the principal library of Hungary, the Széchényi Library are housed. 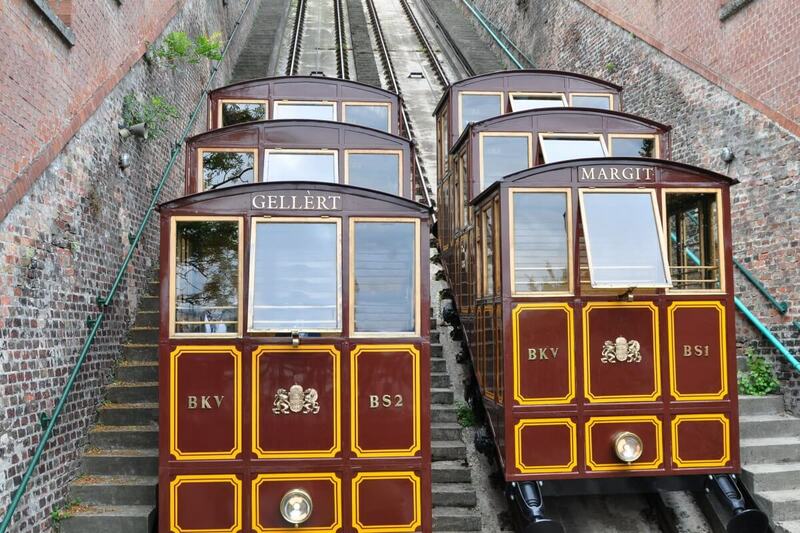 The Palace can be reached from the Danube embankment by the Castle District’s own special funicular railway, the “Sikló”. The two coaches and both stations have been restored to their original nineteenth century condition. When locals say Buda Castle they are usually referring not just to the Royal Palace but to the whole of the medieval town built on Castle Hill, with its charming squares, narrow twisting streets, and fantastic views over the city. Some of the old houses sport Gothic decorated door and window frames. It is worth looking into the courtyards and long gateways, for you can sometimes see a Buda speciality, the medieval sedilia. In olden times the retinue accompanying an important guest could rest awhile in these hollowed-out stone seats with their Romanesque, Gothic and Renaissance decorations. One of the most beautiful Gothic churches in all Hungary stands next to the Holy Trinity Column commemorating the plague of 1709 in Szentháromság Square in Buda. 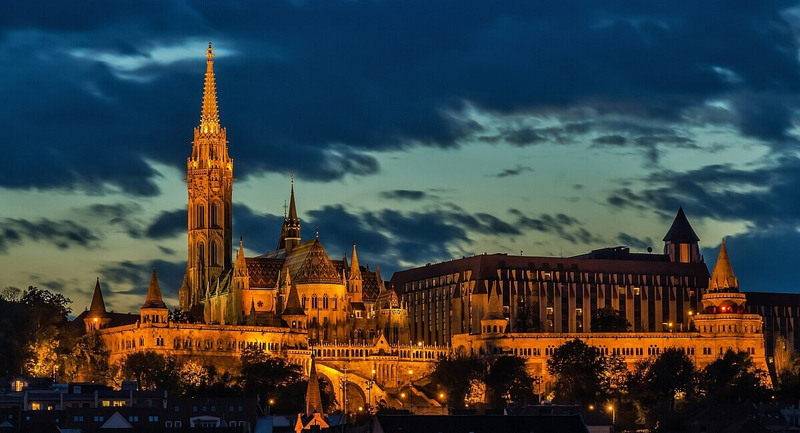 The Church of Our Lady – more commonly known as the Matthias Church – was founded at the same time as the first of the Buda Castles, by King Béla IV. Later rulers left their mark on it, adding a tower here and a door there, and generally enlarging the building, and for a while it was also used as a coronation church. It came to be called the Matthias Church in honour of King Matthias, Hungary’s illustrious monarch, who held both his marriage ceremonies here. Its appearance today results largely from nineteenth century reconstruction, and its excellent acoustics make it a favourite venue for organ recitals and orchestral concerts. A somewhat newer attraction on Szentháromság Square is the House of Hungarian Wines (Magyar Borok Háza), where 450 wines from all 22 of Hungary’s historical wine-producing regions can be tried in the huge cellars. Visitors receive a small cup on arrival and can begin their adventure, for 70 to 80 different types can be tasted within the admission price. If you walk up to the Castle District in the evening from the Danube embankment, the illuminated, snow-white towers of the Fishermen’s Bastion (Halászbástya) rise up ahead, like so many sugar-loaves. You are more likely to associate the sight with fairy tales than with soldiers, although it is the latter who are the rightful users of a bastion. The Fishermen’s Bastion has never served as a defence; it was built in 1905 purely as a lookout terrace and to augment the cityscape. It follows the line of the old city walls and is near the site of a former fish market. And the connection with fishermen? Back in the mists of time it was the Fishermen’s Guild who were responsible for defending this section of the castle ramparts. On the northern and western slopes of Castle Hill it has been known for people to go out into their garden and suddenly find a cave, sometimes with spring water gushing up in it! The northern and central parts of Castle Hill have more holes in them than an Emmental cheese! The caves are very old and were formed by thermal springs. They were developed and enlarged in the Middle Ages and, extending to over six miles, they really did become like an underground town. In times of war they served both as somewhere to hide and as a place where the defence forces could regroup in secret. A part of the system of natural and man-made passages, the Buda Castle Labyrinth, is open to the public. Among the many ways in which Budapest can be summed up, one is as a City of Caves. It is the only city in the world where there are surface openings to cave systems in built-up residential districts. One such is the Pálvölgy dripstone cave system; it is Hungary’s third longest, a protected site and open to visitors for guided tours starting hourly and extending for 500 metres. A 300 metre-long, recently renovated section of the Szemlő-hegy cave is also open to visitors. This is one of those rare instances where the entrance is fully accessible to visitors with impaired mobility. The Lánchíd (Chain Bridge), the symbol of Budapest, was the first permanent crossing over the Danube on Hungarian territory, and only the second along its entire length. The river had long bisected an important trade route, and in early times people were ferried across in boats. By the beginning of the fifteenth century pontoon bridges were being used, and although in winter when the river froze over people could cross on foot or with horse and cart, when the ice started to thaw the two shores were completely cut off from each other. In a particularly cold December in 1820, Count István Széchenyi had to wait a whole week to cross, as there wasn’t a boatman willing to take the chance of carrying him from Pest to Buda between the ice flows. Széchenyi is a legend in Hungarian history for the things he did to develop the capital and the country, and after this experience he declared he would give a whole year’s income towards the building of a permanent bridge. There had been plans earlier than this. One that originated from the end of the 1700’s took the multiple buttressed Charles Bridge in Prague as its model, but this was not adopted. In England Count Széchenyi saw the bridges of William Tierney Clark and, on the basis of those, commissioned him to design the first bridge over the Hungarian Danube. Construction was entrusted to the Scottish engineer Adam Clark (no relation), and the Chain Bridge was officially opened on 20th November, 1849. Traffic crossing the bridge from Pest still had to wait a few more years, though, before it could continue its journey westwards without diverting around Castle Hill. The Tunnel under the hill was constructed in just 7˝ months in 1853; it is 32 feet wide and 32 feet tall, and, at 382 yards long, exactly the same length as its neighbour the Chain Bridge. One of the many anecdotes about these landmarks says that when it rains the Bridge can be pushed into the Tunnel to prevent it from getting wet! According to the superstition, if you make a wish while going under a bridge in a boat, that wish will come true. In Budapest you can have nine wishes. Counting the two railway crossings, there are nine bridges spanning the Danube, of which the newest is the Lágymányosi Bridge, dating from 1995. All Budapest’s bridges were blown up by the retreating Germans in 1945. The majority were rebuilt to the original plans, but the Elizabeth Bridge, named after the popular Queen Elizabeth, was deemed to be in such bad a state that a completely new bridge had to be built in its place. The fine suspension bridge we see today was inaugurated in 1965 after much public debate. The Szabadság (Liberty) Bridge, restored after the War to its original condition, was first opened in 1896 to mark the millennium of the Magyar Conquest. The King Emperor Franz Joseph himself ceremonially hammered in the last rivet with great technical bravura. He had no tool in his hand but stood in a ceremonial tent on the Pest side and pressed a button which activated a 45-ton hammer across on the Buda bridgehead. And so the last rivet, made of silver, was put in place. Subsequently it disappeared, a feat that would certainly have demanded real bravura. There is a replacement now, with a protective covering, but it’s not made of silver. The seven-buttress Margaret Bridge, built to a French design, was Budapest’s second permanent river crossing and opened in 1876. From the central buttress a spur links to Margaret Island, unquestionably the city’s most beautiful park. After the Mongol invasion it became home for several monastic orders; it was at that time known as the Island of Hares, and only later assumed its current name in honour of the pious daughter of King Béla IV. His Margaret joined the Dominican nuns in their new convent in 1252, and remained there until her death. In its time Margaret Island has also been a royal hunting ground, and from the nineteenth century, a 250-acre municipal park. Hidden behind its noble trees are sports grounds, swimming pools, the capital’s largest open-air leisure pool, an outdoor theatre, and two spa hotels. The island, which can also be reached by small boat, is free from traffic, and a very popular way of getting around it is by hiring a “bringóhintó” family cycle car. The north end of the island is connected by Árpád Bridge to both Buda and Pest. The part of the city now known as Óbuda is the site of the principal town of the Roman province of Pannonia. The frontier of the Empire ran along the line of the Danube, and Budapest’s 2,000-year old forerunner was called Aquincum. It was an important military centre, but a civilian town of merchants and artisans also grew up around it. Remains of the military amphitheatre can be seen at Óbuda and, a mile further on, ruins of the streets of the civilian town and some of its houses.